Rheumatoid arthritis (RA) is a long-term disease that leads to inflammation of the joints and surrounding tissues. It can also affect other organs. The cause of RA is unknown. It is considered an autoimmune disease. The body's immune system normally fights off foreign substances, like viruses. But in an autoimmune disease, the immune system confuses healthy tissue for foreign substances. As a result, the body attacks itself. RA usually affects joints on both sides of the body equally. Wrists, fingers, knees, feet, and ankles are the most commonly affected. The course and the severity of the illness can vary considerably. Infection, genes, and hormones may contribute to the disease. Morning stiffness, which lasts more than 1 hour, is common. Joints can even become warm, tender, and stiff when not used for as little as an hour. Joint pain is often felt on both sides of the body. The fingers (but not the fingertips), wrists, elbows, shoulders, hips, knees, ankles, toes, jaw, and neck may be affected. The joints are often swollen and feel warm and boggy (or spongy) to the touch. Over time, joints lose their range of motion and may become deformed. Homeopathy treatment gives a remarkable result in RA. The pain, swellin, morning stiffness can be completely cured with homeopathy. In our Multicare homeopathy online treatment center peoples suffering from RA have been benefitted using our advanced homeopathic treatment packages. 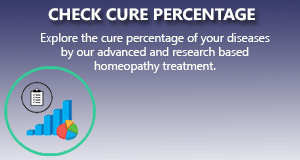 We apply the most scientific and research based homeopathy treatment package that gives a long standing cure to the ailment.